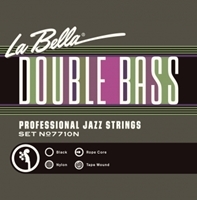 Over 20 years ago, LaBella worked together with both Attila Zoller and Ron Carter on this double bass string construction. Obtaining the tone of gut and the sustain of metal, this string design is great for Jazz pizzicato solos. The rope gut core with the black nylon tape outer-wrapping provides a bright attack with a warm tone. This set can be used as Ampeg Baby Bass strings as well. Our Band has used these on our 3/4 upright for 5 years and they are still going strong. Nice bright volume. The best thing is that they are so easy on the fingers. Our bass players could usually only last about an hour on the old steel strings before getting bloody. The bass players love these - and can play for hours. PROS: Tons of sustain and tone next to gut strings. it will definitely make your bass louder, it makes my bass sing for sure! CONS: Very bright sounding strings. I've had for over 3 weeks with constant playing and the strings should've break in at this point like it did with my previous Spirocore strings. Overall, it's a nice set for less than 150 bucks. If that's your budget and you are looking for something less "modern" I would say go with Helicores or the Savarez Corelli 370M. Can't go wrong with those ones.